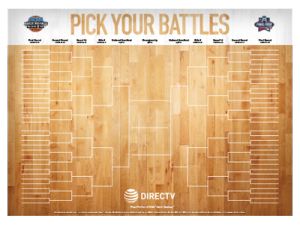 The BUSINESS SELECT™ PACK from DIRECTV has more than 90 channels with your local channels, including CBS, truTV, TBS and TNT – the 4 channels that on which you can show your customers the NCAA Basketball Tournament, and you can get it for just $29.99 per month when sign up for auto bill pay with an additional $10 off for the first year when you act before May 11th. If you are already a DIRECTV subscriber at your home, you can refer your business and get $10 per month off both at your business and at your home. That is $100 in additional savings for you at home and for your business. the $10/mo. credit will cease and DIRECTV services will automatically continue at the then-prevailing rate. 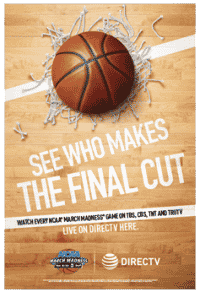 *GENERAL TV SERVICE TERMS: Receipt of DIRECTV programming subject to terms of DIRECTV Commercial Customer Viewing Agreement; copy provided with new customer information packet. DIRECTV programming, pricing, terms and conditions subject to change at any time. Taxes not included. Additional receiver fees of $15/mo. apply for the first and each additional receiver. SONICTAP MUSIC CHANNELS OFFER: After 3 mos., then-prevailing rate for SonicTap Music Channels (currently $37.99/mo.) applies unless canceled or changed by customer prior to end of the promotional period. HARDWARE OFFER: Programming agreement, as defined by customer’s commercial programming rate card, required. Offer available to new commercial customers in commercial structures no more than three stories high. No single-family residences allowed. Up to four free HD Receivers per commercial location. All DIRECTV Receivers must be continuously connected to the same land-based phone line or the Internet. INSTALLATION: Standard professional commercial installation for BUSINESS SELECT PACK and above customers. $49 standard installation applies for COMMERCIAL BASIC customers. Complex/custom installation extra. Applicable use tax adjustment may apply on retail value of installation. $19.95 Handling and Delivery fee may apply. are trademarks of AT&T Intellectual Property and/or AT&T affiliated companies. All other marks are the property of their respective owners.